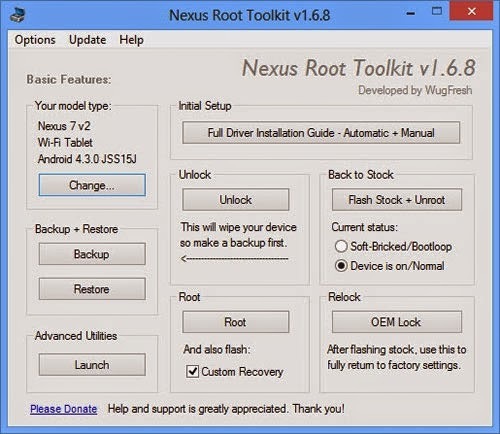 Nexus root toolkit is a software for Windows which aims at simplifying the rooting process of Nexus devices. This tool was created to ease the process of rooting Nexus phones and tablets. Rooting Android phones is not an easy task for many. It requires users to perform different advanced functions and follow advanced directions. Doing this is not always easy. Users may get confused on certain steps, have little knowledge about performing some manual actions, might forget some steps totally or might not know how to perform some actions at all. Keeping those problems of users in mind, Nexus root toolkit was developed. Simplifying the rooting process seems to be the goal of this toolkit. The screenshot shows that there are buttons that you can simply press. One might even get the impression that he or she can just connect the phone and press on those buttons in the required order to root their phone. But that is not the case. Users might have to download drivers and files which are specific to their devices with correct version numbers. Users will have to restart phones, connect it and disconnect it just to connect it again. Backing up files is also necessary. Users should also understand that rooting any device with tools like this one will simplify the process but is still meant for users who can follow instructions accurately. Videos on rooting using this toolkit are useful sources to perform root processes successfully. Users should also know that they are vulnerable to bricking their phone in the process. It also takes some time to root phones. You cannot just expect to press some buttons on the screen and the phone restarts as a rooted one. Downloading files, copying files and completing certain actions take long times. So, when you finally decide to root devices make sure you understand the risks, problems, difficulties that may come and use tools like this one to make it easier.